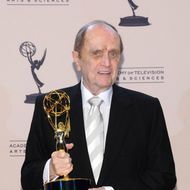 Bob Newhart won his first Emmy ever yesterday. He earned the award for his guest role on The Big Bang Theory, but he’s been nominated for Emmys six other times, starting in 1962. Melissa Leo won for Best Guest Actress in a Comedy for her role on Louie — well deserved, though we were pulling for Molly Shannon to win for her role on Enlightened. Ah, well. On the drama guest-star front, Carrie Preston won for her performance as the slightly nutty Elsbeth Tascioni on The Good Wife, and Dan Bucatinsky won for his performance on Scandal. Behind the Candelabra won eight awards, including ones for outstanding hairstyling, prosthetic makeup, non-prosthetic makeup, and costumes for a miniseries of movie. Game of Thrones picked up Emmys for special visual effects and makeup, and Boardwalk Empirewon in four categories, including single-camera art direction. South Park won outstanding animated program, and Children’s Hospital won for short-format live-action program, Undercover Boss somehow won for outstanding reality program, and Heidi Klum and Tim Gunn won their first Emmys for hosting Project Runway. The full list of winners is here, but those are the biggies.